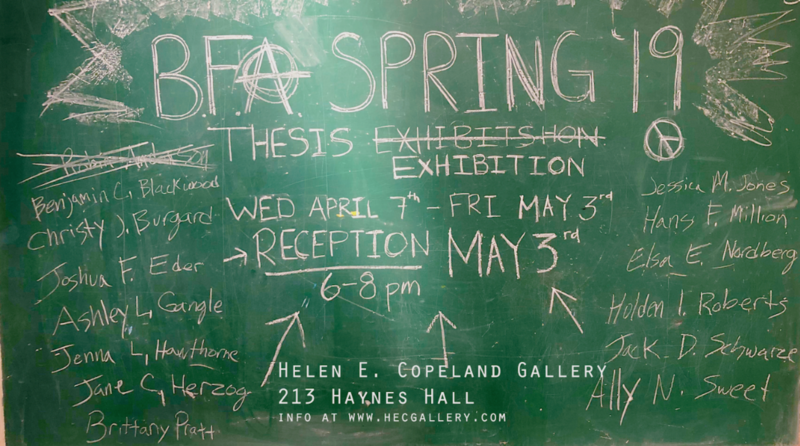 The School of Art at Montana State University is pleased to announce Bozeman Collectors Show at the Helen E. Copeland Gallery located on the second floor of the School of Art in Haynes Hall, Bozeman MT. The show will be on exhibit Friday, September 19th until Wednesday, October 4th, 2017. The reception is Thursday, September 21, from 6:30 – 8:30 p.m. and will be free and open to the public. Hors d’oeuvres will be served, as will a full cash bar. On view will be a variety of works from four local collectors: Jonnie and Bruce VanLandingham; The Collection of Professor Emeritus Willem Volkersz and Diane Volkersz; collectors Kristi Dunks and Richard Nelson of the Silver Bow Art Museum; and retired diplomat, Ross Rodgers and MSU’s KGLT Radio Manager, Ellen King-Rodgers. The exhibition, hung salon style, will include works by artists like Robert Rauschenberg, Noah Massey, Gene Davis, Gail Singer, José Bartoli, Sergio Gonzales Tornero, and Robert E. Smith, and more. According to Michele Corriel in her article “Collector’s Eye: Native American folk Art Collector, Bruce VanLandingham” in Western Art and Architecture, “With a vast knowledge in the history and authenticity of their collection, Bruce and Jonnie VanLandingham have been passionately collecting art for more than 40 years. Since opening Sundog Fine Art in 2014, they have successfully brought the traditions of Native-American and western folk art, as well as its contemporary fine-art forms to the Bozeman scene. From Navajo textiles and found objects to contemporary paintings and photographs, the VanLandingham’s collection showcases the relationship between yesterday’s western works with those they have inspired today. Complementing these will be American folk and outsider works belonging to collectors Willem and Diane Volkersz. “I have collected since childhood,” Willem tells, “I still have a coin collection that I started in the 1940’s. I now collect ceramic objects, globes, and other “found objects” that then become an integral part of my sculpture. Together, Diane and I have collected many things, a.o. quilts, contemporary American folk art, tinware, ceramics and work by contemporary Montana artists.” The Volkersz recently donated 38 objects to the Missoula Art Museum and 372 to the John Michael Kohler Arts Center in Sheboygan, Wisconsin. No stranger to MSU, Professor Emeritus Volkersz is a renown artist himself with an explorative familiarity of the American West which his personal collection certainly personifies. Willem Volkersz–American Landscapes is currently at the Oats Park Art Center in Fallon, Nevada through mid-November. Also contributing to the exhibition, Ross Rodgers and Ellen King-Rodgers’ collection is “very eclectic, with emphasis on American modern and contemporary, Asian art, and support for local artists.” The couple states, “We hang wall art salon style and, in our small home, have long since run out of space on the walls for more, so that collecting anything new means taking down something already there.” As world travelers and art lovers, they collect everything from Depression era glass to Nepalese religious icons. Greeted by their flirtatious cats and dogs (who will lick your ear from above while you view the work hanging over the staircase), guests in their home can sense their earnest love of art in their collection. Personal items such as small paintings by Ellen’s mother, to works by A-list artists, to stylized finds from yard sales and local fairs, Ellen and Ross’ collection shows their opposing aesthetics, while converging to illustrate a marriage full of mutual appreciation for the other’s unique tastes. For more information on this exhibition, or on the Helen E. Copeland gallery in general, please follow us on Facebook (http://facebook.com/msuhecg).